SIVATEK is gypsum based specially formulated ready-to-use bagged plaster that can be applied on directly brick, concrete, aerated-concrete, etc. Coarse mortar-fine mortar distinction vanishes with SIVATEK.Long workability time enables an easy application with low waste rate. It can be applied as one layer of 5-40mm thickness over brick, concrete and aerated-concrete wall surfaces; and in 5-20mm thickness over ceiling and exposed concrete surfaces. SIVATEK does not sag during the setting period, on the surfaces which it is applied.It has high resistance, surface hardness and adherence. Special grain-size distribution, gives a fine glossy appearance. 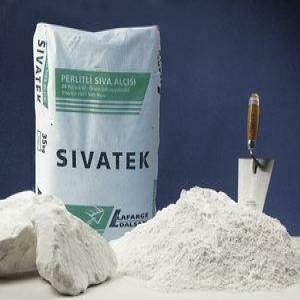 SIVATEK leads to a healthy environment by regulating the moisture, due do it is a breathing material. SIVATEK can also be conveniently used in humid places. It is an incombustible material. Because of the water in its structure, it is a fire retarder. It does not cause mould, bacteria and fungus.